Even if you don’t like eggplant, you will love these burgers, which really don’t taste like eggplant at all! Try them with Spicy Onion-Pepper Relish. I often think of eggplants like George Carlin’s leftovers. When you buy one, you feel really good for bringing home this healthy, shiny vegetable. Then you put it into your fridge and forget it for a week or so, and when you pull it out, it’s all dull and sunken in places, and you feel…. Well, that’s where the comparison ends because, if you’re like me, you feel guilty that this once-beautiful food has gone to waste. It used to happen to me more often than I want to admit until I hit upon a solution: If I haven’t used the eggplant after two or three days, I cut it in two and roast it in my toaster oven. Eggplant will last longer once it’s cooked, giving me time to figure out what new and adventurous recipe I want to create with it (though most of the time my cooking muse is silent and it becomes baba ganoush). Baba will probably always be my favorite way to use roasted eggplant, but these veggie burgers and the pesto I posted earlier this summer tie for second place. Even if you don’t like eggplant, you will love these burgers, which really don’t taste like eggplant at all (ask E the Eggplant Hater, who enjoyed her burger even knowing it contained eggplant). I enjoyed the flavor of mild curry with the lentils and eggplant and, being the heat-lover that I am, spiced them up by serving them with a fiery relish made from onions and a jalapeno pepper from my garden. If you’re not a curry lover, try changing the seasonings to suit your taste. I can imagine the ingredients going well with chipotle and chile powder or harissa and cumin. Have fun and be adventurous! 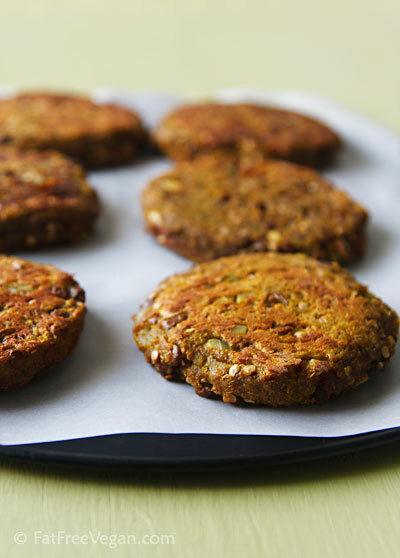 One note: Like most veggie burgers, these will fall apart if you try to cook them on a barbecue grill, but once they’re baked, they hold together well and can be reheated on the grill, making them a perfect food to bring to a Labor Day picnic. These tender burgers are lightly curry-flavored but not spicy. To add heat to your burger, top it with a little Spicy Onion-Pepper Relish, below. Once the eggplant is cool, discard any liquid that has accumulated and scrape the flesh from the peel. Place the pulp in a food processor and pulse a few times to make a coarse puree. Transfer to a medium-sized bowl and add the remaining ingredients. Mix very well and allow to stand at room temperature for 20 minutes. Preheat oven to 425 F. Line a baking sheet with parchment paper or silicon baking mat. Heat a large non-stick frying pan over medium-high heat. Once it’s hot, wipe or spray it with a little pan spray or canola oil. Wet your hands and form eggplant mixture into patties about 3 inches wide and 1/2 inch thick. (You can also form the burgers by spooning the mixture into the pan and using the back of a spoon to shape it into patties.) Cook three or four at a time until lightly browned and then carefully flip over and brown the other side. Remove with a spatula and place each burger on the prepared baking sheet. Bake for 15-20 minutes, until burgers are cooked through. Serve with traditional hamburger condiments or with Spicy Onion-Pepper Relish. After cooking, my eggplant provided about 1 1/2 cup or 10 ounces of pulp. If your eggplant is significantly larger or smaller, your results may vary. Combine all ingredients and allow to stand for 30 minutes for flavors to blend. For hotter relish, add extra cayenne pepper to taste. Just wanted to ask if we need to change anything in the recipe is we cook the burgers on a pan instead of baking them in the oven? You might try covering the pan for part of the cooking time to steam them a little. Other than that, I suggest long cooking on each side at a low setting. Good luck! I would really love to try these out Susan. Looks and sounds delish! I just recently (last week) tried Indian food for the first time and am in love. Was wonderig what type of curry powder you use..? Also, do you think cardamom would work in these ? I buy a curry powder called Maharajah from Penzey’s or from the Spice House, both of which have online stores. Cardamom would work if you blend it with cumin and other seasonings (which is what curry powder is, a mixture of spices). If you can get it, I really recommend the Maharajah, though. I’m very interested to try these out – have you ever used spelt flakes in place of the quinoa flakes. Just curious. I haven’t tried spelt flakes, but if they cook in about the same time as quinoa flakes or oatmeal, they should work. If you try, please let me know how they come out! I made this today and it turned out great. I substituted quinoa flakes with rice flakes which can be found in most Indian stores as “poha” or flattened rice. Thanks for the recipe! Looks great! I am a Vegan starting today due to health reasons and I will try these this week! You give me great hope in a yummy future! These look great and I just got everything to make them- almost. I don’t have any corn or potato starch and am living in France where these things don’t seem to be easy to come upon. Any ideas? Thanks! Can you get arrowroot? You can substitute the cornstarch with about 1 1/2 times as much arrowroot. I just discovered your site yesterday and am already addicted! These burgers look gorgeous. I plan to make them this evening. My husband’s not a big aubergine fan but after reading the reviews I’m hoping he won’t even notice. I made your samosa wraps and lentil and veg stew last night and they went down a treat, particularly the wraps. They were so tasty. Thank you again. Oh by the way I can’t get quinoa over here (I’m Irish living in Damascus) so was wondering if bulghur would work? Thanks for all the great comments, Kim. I worry that bulghur won’t hold these burgers together very well. I suggest oatmeal (the sliced oats, not whole ones) or oat flour (oats ground in a blender) instead of the quinoa flakes. Good luck! Thank you for the reply. I appreciate how busy you are. Well you were right about the bulghur-it was hard to keep them together but I managed it by using your method of forming them with the spoon and just being really gentle. They were delicious. My husband hadn’t a clue they contained aubergines so he was pleasantly surprised. I’m in the middle of roasting some tomatoes for bruschetta. Your description sounded so nice I had to try it. Again thank you so much for taking the time to test and perfect all the recipes. Your efforts are very much appreciated. I’ve been a long time follower, but this is my first comment. I made these last night and my husband and I just DIED! They were so good! I kept thinking about them all day today. I’ve tried many recipes from your blog, and have loved every one of them, but this one just blew us away! Thank you! Delicious, just like all your recipes. I used oatmeal for the quinoa flakes cause that’s what I had and they came out great. I didn’t make the salsa because these pair PERFECTLY with hummus, my fav. 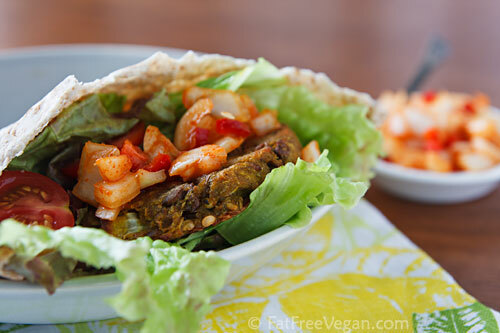 I have tried many many veggie burger recipes and this is one of the very best in terms of not falling apart as many recipes tend to do. AMAZING super food. We just finished eating and it was beautiful. We made it alongside a cherry tomato and mixed greens salad, super finely chopped and added some avocado to the relish to make it more of a paste so we could scoop it up. SOOO tasty! Thank you! I’m sorry to hear that, Mari! I did use brown lentils, which are a bit mushier than puy lentils, so that might have been the problem. Ah I thought afterwards I should of used something like split red lentils as, like you say, they are mushier and would have the right consistency. Will definitely try these again. Take number 2 Susan and they turned out perfect! These are SO yummie 🙂 I don’t eat wheat so had these with a nice salad and some spicy guacamole! What type of lentils do you recommend? Brown lentils – just saw your comment above. I take it you mean the round disc green/brown ones. That’s right. They’re the only ones that most grocery stores carry. The French lentils (puy) are probably not soft enough. Wow. These are really, really good. They are so flavorful! Everyone in my family loved them and agreed they were repeat worthy. They really weren’t even that hard either! I cooked the eggplant in the morning and then finished the recipe in the evening. I didn’t have the smoked paprika so I just used the Hungarian sweet. Amazingly the regular supermarket in a small town in Australia, Coles, carries quinoa flakes and agave nectar so it was easy to get the ingredients too! We had ours with the relish and romaine lettuce and tomato slices and sliced beetroot and they really didn’t need anything else to be absolutely perfect. The sliced beetroot is a really great addition – I very much recommend it. I love that these are so healthy and also so tasty. 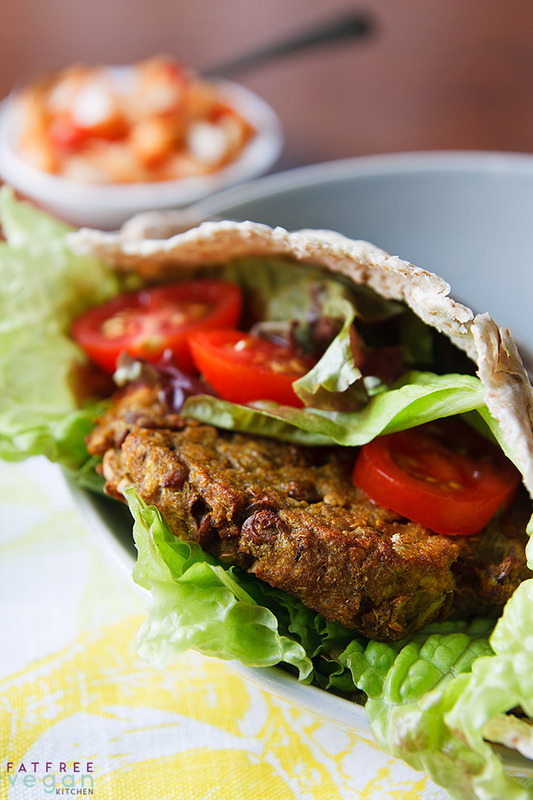 I love food with lots of herbs and spices and these burgers fit the bill! I was also impressed by how well they stuck together – something vegan burgers don’t usually do so well. A++! Thanks for yet another fantastic recipe Susan! Can’t wait for your cookbook! Yum!! LOVE that you don’t add extra fat!! I just made these today….doubled the recipe….company coming for dinner tomorrow. Used a # 16 scoop which I sprayed with some Pam and lightly flattened with the back of the scoop until 1/2″ thick. A doubled recipe made 18 patties. These burgers are delicious! My 12 year old loves them. Thanks for the recipe! Thanks Susan! Can You recommend other vegetable instead of eggplant? I made these last night and they were awesome. I’m going to make a double batch this weekend and freeze them for easy suppers during the week. SOOO delicious! I just wanted to let you know I made these for dinner tonight and we loved them! I did use Whole Cooked Quinoa and a some extra Whole Wheat Panko crumbs to help bind them, (since I did not of the Quinoa flakes on hand) and they worked out perfect! here is my question: can I freeze this? could I make a big batch and freeze small portions to reheat on a skillet? Yes, I think it would freeze very well. In the ingredients, do you mean 1 cup of dried lentils, cooked, or 1 cup of previously cooked lentils? 1 cup of previously cooked lentils. To anyone thinking of making these……MAKE THEM! THEY’RE DELISH! I made these tonight for my partner and a friend and we all LOVED them! 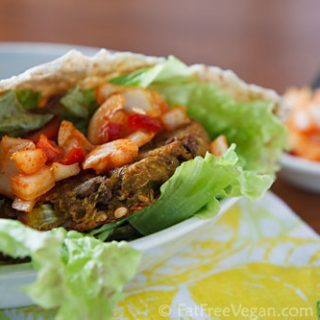 We’ve just started eating vegan, and this is definatly one of the best recipes I’ve come across so far so thankyou so much for it, it will definatly become a regular meal for us! Hello, I just made this delicious patties. I used arrow root, and my eggplant wasn’t as big, so I added zucchini, used split peas instead of lentils because I didn’t have any. However, I had issues cooking the patties. First I couldn’t sear them in the pan, I guess they were probably to wet and I didn’t want to use to much oil. So, I decided to bake them only, put parchment paper, but they got stuck, I couldn’t get them off without losing their browned bottoms. Any suggestions? I loved this recipe! Thanks for posting. I am a big aubergine fan at the moment, and this is a great new way to eat them. have been looking for a specific resipe that I saw ina magazine or catalog and now cannot fidn it. The recipe was for eggplant patties made with red curry paste. Bought the paste and now cannot find the recipe. is very frustrating. Honestly, this is probably the best veggie burger I’ve ever made! Made these last night for my family and they were fantastic!! Will definitely be a family favorite. Loved they way they held together and didn’t disintegrate like many other veggie burgers. Also, they had a great texture and so full of flavor. I tried these today, and my husband and I really enjoyed them. I used yellow split peas because they were all I had, and they were a little too crunchy, so I would use the brown ones next time, but the flavor was great, and otherwise we liked the texture too. My husband saw the eggplant in advance, and doesn’t like eggplant’s taste or texture, so he started out with a bias against them, but still said he enjoyed them and would like to have them again. (And he doesn’t hesitate to say when he doesn’t like something!) I used quick oats pulsed in the food processor instead of the quinoa flakes. I really liked how the burgers held their shape. I prepped the eggplant last night and the lentils and cooked it up today. Lets just say the patties are all gone. What a great way to use eggplant! These were DELICIOUS! I didn’ t have quinoa flakes, so I substituted quick-cut oats. And the onion relish is perfect with them! Next time I will double the recipe and freeze a batch for later. Yum! We just finished having these for dinner and my daughter (who doesn’t like eggplant) never knew what she was eating. Thank you again and again for your wonderful blog; every time I need a new recipe I come here first because I know it will be delicious and healthy. Please know that your work is very much appreciated. Oh my, delicious! And this is from the girl who rarely follows through w/ veggie burgers because it’s just too much trouble. Always end up just tossing ingredients in a pan and making a one-pot meal. But this was easy and worth the baking step. Used oats whirled in blender in place of quinoa flakes, browning in pan didn’t work out at all so just baked in oven. Crispy, perfectly spiced patties. The relish was also great mixed in with my steamed kale. Never fails, you’re my fav vegan kitchen lady! Hi Susan I was wondering if I can use cooked quinoa instead of quinoa flakes because unfortunately, they r not available where I live. If so how many cups of cooked quinoa should I use?? I’m afraid that quinoa wouldn’t have the binding effect that the flakes have and would probably make the burgers fall apart. Can you use oatmeal or brown rice flour? I can use brown rice flour instead but I wanted to know the quantity .. Should ibises more or less than a 1/2 a cup?? I can use brown rice flour instead but I wanted to know the quantity .. Should i use more or less than a 1/2 a cup?? I would use 1/3 cup and add more as needed to make them stick together. I tried the burgers with quinoa flour they tasted amazing but they didn’t hold quite well. So I’m gona try the oatmeal. I just wanted to clarify the oatmeal u mean the rolled oats flour or u use the rolled oats as they are. I would either use the rolled oats as they are or process them lightly in a food processor to make them a little finer but not completely ground into flour.